Just some shots from the weekend. Did a bit more work on some necks, a neck through Galaxy, and mocked up a bolt on Raven. Yep, this one has an ebony veneer. Mornin' yo! Let's unclamp and shape that headstock! The one on the right is 3 piece maple, 25.5 scale ebony board, MOP dots. The one on the left is scarf jointed, has a 25 scale, and I routed the headstock for binding. Not sure what fretboard wood I’ll put on it, but will most likely be rosewood. They’ll both get SS frets. 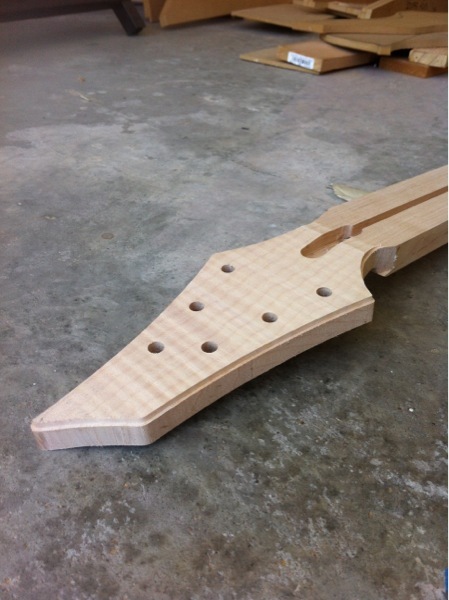 I’ve got two more 3 piece maple necks that have been routed for truss rods; they're getting their ears glued on.